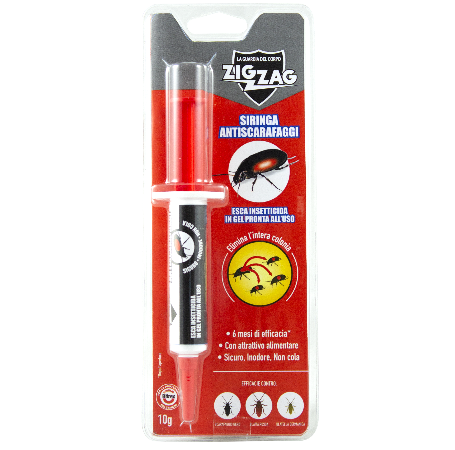 Zig Zag Syringe Antiscarafaggi is an insecticide in gel formulation for indoor use, effective against the adult species of Cockroach stoker (Blatella germanica, light brown color and with a length of about 1.5 cm), Black Cockroach (Blatta Orientalis, colored black and with a length of about 2 cm), Red Blatta (Periplaneta Americana, reddish brown and longer than 3 cm). The product contains a bitter substance intended to prevent accidental ingestion by non-target people or animals. Safe, odorless, it does not drip. Always read the label before using the product and comply with all instructions for use. Perform an inspection before applying the product to see the level of infestation and the affected areas. Press the tip vigorously to remove the cap. Dispense the gel forming a short line of about 3 cm near the infestation.Close the syringe with the cap for other applications (the product remains effective for the following 6 months). The product can be used indoors (private homes and / or public buildings, residential, commercial, industrial).